Hi, i'd just like to ask, can focus energy be baton passed? Hi I got a question, I can't find an answer anywhere. Would you still lose the item? I'm pretty sure Baton Pass works with any move that raises stats. no there is not a fast way to get shiny starters and there is no fast way to get shinies at that and if you tried 8000 times you would have to be like an idiot because no one wants to start over again 8000 times just to get a shiny starter you might as well just stick with the normal starter because i dont know whats wrong with it. well you could always put 5 eggs and a Magmar in yr party. That'll speed up the breeding, or use GTS, i got a shiny Turtwig that way. how do you access a debug menu (if there is one)? Location: on my charizard riding round my house! That's because the gender chance for fossils is 87.5:12.5 . That means you have a 1/8 chance of getting a female. If you just want to breed, don't worry - you can still use Dittos to breed with male pokemon (Everstone trick works with Ditto too). <Derek> is anyone here ?? Hey everyone. I have yet another question. In the Liberry (Berry Guide) for Sinnoh, there is one stat that I'm unsure about. What does the Water Absorbtion stat affect? And how does it affect it? I could be wrong but I believe it's how many hours before the berry plants water level goes down by 1 (dark dirt to tan dirt, tan dirt to light dirt). Someone should validate that for me though. Last edited by HaIPwndMe on Wed Feb 13, 2008 2:58 pm, edited 1 time in total. This might be a dumb question, but I was soft resetting for a shiny Drifloon yesterday for hours and I left my game in the middle of an encounter before I went to bed. Today the Drifloon is still there. Does it normally stay outside the Valley Windworks if you don't capture/kill it after Friday? Shinies appear at random so....it'll be practically impossible to reset for shinies it will take long, very long You are still battling the Drifloon right? still soft resetting away. I'm sure i'll hit a point that I'll stop caring but I'm doing it while I do other things so it's not so bad. Is it faster to breed for a shiny? I left my game in the middle of an encounter before I went to bed. Today the Drifloon is still there. Does it normally stay outside the Valley Windworks if you don't capture/kill it after Friday? No. It's possible that, if you didn't change routes, the game did not refresh the change. Did you leave it in sleep mode, or turn it off? As long as it takes to find 8192 (or more) Drifloons. It's just luck. It must be because I haven't left the area. I even tried turning it off for a while (it was in standby before) and it's still there. If I had a Porygon with the ability Dowload, would I get a 2 and Z with the same abilities if I evolved it? If I had Trace on it, would I get Adaptability on Z? How do you get into the Wayward Cave secret entrance? I remember hearing something about using Strength under a bridge, or something like that?? To get to the secret area, the entrance is directly under the Cycling Road path. 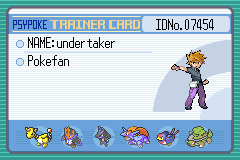 How permanent is your trainer ID? If you reset your game is it still the same ID? im pretty sure the trainer ID corresponds to the actual cartridge, so the only way to "change" your ID would be by getting an entirely new game cartridge. Wrong. Everytime you start a new game, your ID changes. Hmmm so is the only way to esentially "prove" that a pokemon traded out into the world came from you is by never resetting any cartridges you've transferred them from. Am I right? This is the question I guess I was really asking. Or just record your ID number + name combo, and check the pokemon for it.